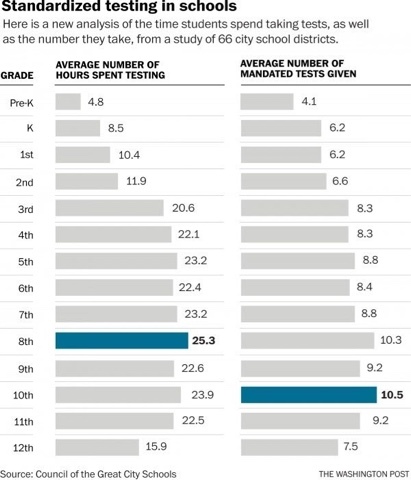 A typical student in the U.S. takes 112 mandated standardized tests between pre-kindergarten classes and 12th grade, the Council of the Great City Schools study found. By contrast, most countries that outperform the United States on international exams test students three times during their school careers. The study reveals standardized testing has become a congestive jumble of tests layered upon tests under mandates from state and local governments, many of which the study argues have questionable value to teachers and students, or the quality of eduction in U.S. public schools. Testing companies that have aggressively lobbied legislators to mandate layer upon layer of their tests also share the blame, the study said. Companies that create and sell standardized - one size fits all - achievement tests are all owned by large corporations. Like all for-profit businesses, these corporations attempt to sell ever more of their growing standardized test product lines to increase revenue and profits for their shareholders, quarter over quarter and year over year. In view of the nation's substantial curricular diversity, state to state, and often even school district to school district, test developers are obliged to create a series of one size fits all assessment tests. But, as most of us know from attempting to wear one size fits all garments, sometimes one size really can't fit all. The designers of these tests do the best job they can in selecting test items that are likely to measure all of a content area's knowledge and skills that the nation's educators regard as important. But the test developers can't really pull it off. Thus, standardized achievement tests will always be mismatched with what's emphasized instructionally in every state and every school district. There are no requirements to "field test" standardized tests or otherwise validate their quality and correctness. There is no process for schools or teachers to appeal or revise poor test questions, nor is there a process to address incorrect test questions and answers. 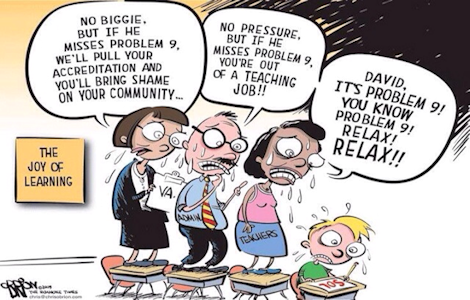 Thus, to have their students score well on the standardized tests, teachers are forced to teach to the standardized tests, as they are delivered from testing companies, rather than teach locally mandated curricula, or risk their students scoring poorly on the various standardized tests mandated by their state legislature. The overemphasis on testing has led many teachers to eliminate projects and activities that provide students with an opportunity to be creative and imaginative. Scripted curriculum has become the norm in many classrooms. There is nothing creative or imaginative about learning how to fill in a bubble sheet for multiple multiple choice standardized tests. Students are so tired of prepping for and taking standardized test that some have protested by dressing up like zombies to protest — and thousands of families are opting their children out of taking high-stakes standardized exams. Teachers spend so much time on prepping for tests and administering them that the traditional curriculum no longer exists. Science, history, civics, world languages, music, and art are no longer taught because of the inordinate emphasis upon reading and math mandated by the regimen of standardized testing. Education today is simply standardized testing and test preparation! This dumbing down of the public-school curriculum is creating a generation of children who are never taught how to question and think, but only blindly to accept the “right answer” — a dictator’s dream in subjecting a submissive population to the Gospel of the ruling class and its media evangelists. Every student is a unique individual with their own talents and abilities. The standardized testing regime fails to recognize the importance of individual achievement in education and instead uses a “cookie cutter” approach to learning that ignores students’ individual interests and abilities. After more than a dozen years since state and federal law makers tied high-stakes standardized testing to school funding and teacher salaries, students are no more ready to do well in college than they were before — and many are less so. Corporate CEOs complain that students aren’t learning the kinds of skills needed to succeed in the modern workplace. Standardized tests as they are used in U.S. public schools today cannot assess or improve critical thinking well, if at all. It is also true that many students do poorly on standardized tests even though they may have achieved mastery over the material. The stress of “test anxiety” can be debilitating for many students. There are many other problems with standardized testing, too. Many test questions are flawed: some have no right answer, while others have more than one; some questions are unclear or misleading; others are too difficult by two or three grade years beyond their intended age group; some questions are politically slanted; others contain product placements; some cover material never taught; and others are culturally biased against students of racial and ethnic minorities, poor students, and students with disabilities. The standardized testing business has become just another vertical corporate industry with products driven by Wall Street profit motives. Moreover, they were developed behind a veil of proprietary corporate secrecy by a employees of those corporations who increasingly have no student classroom experience. Increasingly few corporate test developers are subject-area experts, early-childhood educators, or have been teachers of children with disabilities. The only winners in the current multi-billion-dollar standardized testing environment are the corporations that market their standardized test products, and educational consultants and vendors, whose coffers have been fattened by billions in tax revenue intended for children. Those corporate Wall Street interests, rather than local school boards now determine what is taught in classrooms in school districts across America. The billions of tax payer dollars - property taxes paid by homeowners - now flowing to corporations marketing standardized test products should instead go directly to our public schools to hire more teachers so that students can have individual attention in smaller classes; hire school nurses, guidance counselors, psychologists, social workers, and librarians to deal with students’ physical, emotional, family, and intellectual needs; offer richer, more varied, and well-rounded academic programs; and make needed repairs to school buildings.